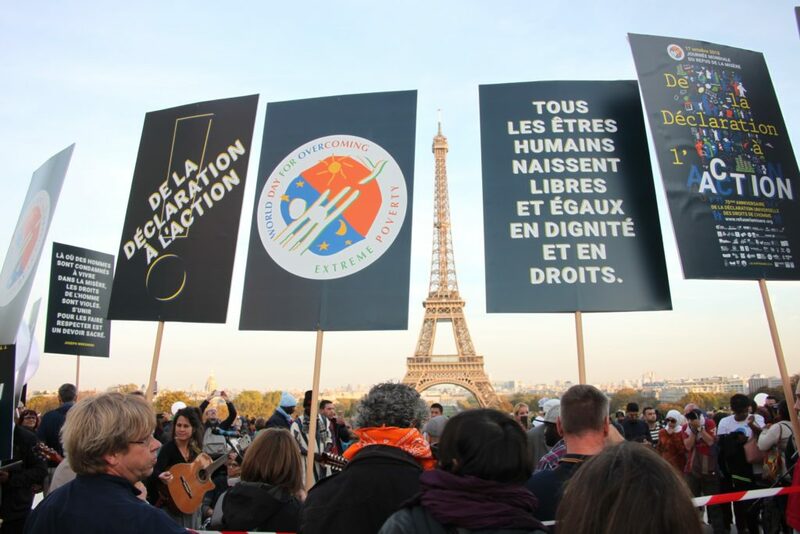 In October 2018, ATD Fourth World’s international centre near Paris hosted a global gathering of activists living in poverty, their friends and allies from other backgrounds, and members of ATD’s full-time Volunteer Corps. The goal was to speak about personal experiences in striving to overcome poverty and to renew motivation to continue. Below is the view of a participant from the UK. There were nearly eighty of us from 24 countries across all five continents and of all ages who came together. This global gathering was one of the most extraordinary and inspiring recent events I have experienced with ATD Fourth World. For many it was their first trip to another country and not achieved without first overcoming some considerable obstacles, making significant sacrifices. We worked in at least eleven languages, but often gestures and signs were sufficient to communicate. With a little effort it was possible for everyone to feel part of what was going on and get to know each other. The focus of our meeting was hearing stories and forging bonds of friendship around all of the things that we held in common. Our experiences differed hugely in respect of our day-to-day lives, but we were united in our solidarity and understanding, and also in our pride in being part of the community and fellowship that is ATD Fourth World. Mr Parfait from the Central African Republic summed it up when he said: “You must never keep the light to yourself”. As ever, it is important to tell others about what we have shared together. This brief article cannot possibly cover all the things that happened, but there were some very important outcomes that bode well for the future of our movement. We were able to build confidence in each other in being able to unite in the struggle for human rights and to end the violence of poverty. We know that we are not alone and can come together to make a difference. We gained strength from understanding that people from all walks of life and in all circumstances are committed to the struggle to understand poverty, to take risks, to ask questions, and to challenge the status quo. Together with others, we all strive to build projects and actions that reach out and recognise people’s dignity. We could see the bigger picture and share the possibility of developing a global vision which will change the way that people see and understand poverty. We aim to reach out to others, inviting them to join us in the new ways of thinking and acting which arise out of taking seriously people with a lived experience of poverty. Hopefully this will lead to us finding bigger and better ways of putting people in touch with each other and maintaining contact, meeting regionally, and building a different world for today and tomorrow. Together we can remove the obstacles which prevent people living together in peace with their families and taking their rightful place in society.